This recipe is a lovely treat for fall. It’s simple and low maintenance- squash and a bit of heavy cream baked together. This could be a side but I see this much more as a dessert. The maple/cream combo caramelizes the edges while the remaining heavy cream collects in the bottom well of the squash. It’s a creamy dessert that seems too good to actually be healthy. 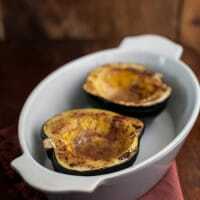 While you could try other squash, I think acorn squash is the perfect fit for this recipe. Preheat oven to 375˚ F. Slice the acorn squash in half and remove the seeds. On the bottom of each half, cut a thin slice off so that the acorn squash doesn’t wobble. Place the squash cut-side up in a baking dish. 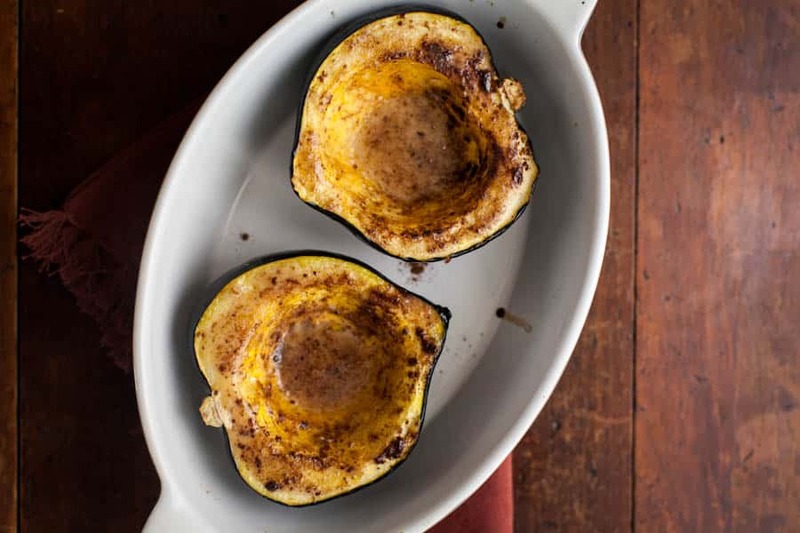 For each half, take a knife (or fingers) and rub the inside of the acorn squash with butter. Whisk the heavy cream and maple syrup together, then add to each squash half. Sprinkle cinnamon over both. Roast for 45 to 55 minutes until squash is tender. Half-way through roasting, remove squash and spoon some of the heavy cream mixture over the exposed squash parts. Squash: Acorn squash is really the perfect squash for this dish but I’ve also use pumpkin cut in half. Granola: While it’s not pictured here, I love this roasted acorn squash topped with a dollop of yogurt and a sprinkle of granola. I love eating squash like this! I usually use brown sugar, but maple sounds like a way better plan! Pretty, has to smell amazing and the taste has to make me weak in the knees – amazing job! I definitely went through a long (single girl) phase where I ate whole kabocha squashes for dinner. it was awesome. agreed that more winter squash recipes deserve a little dessert attention. 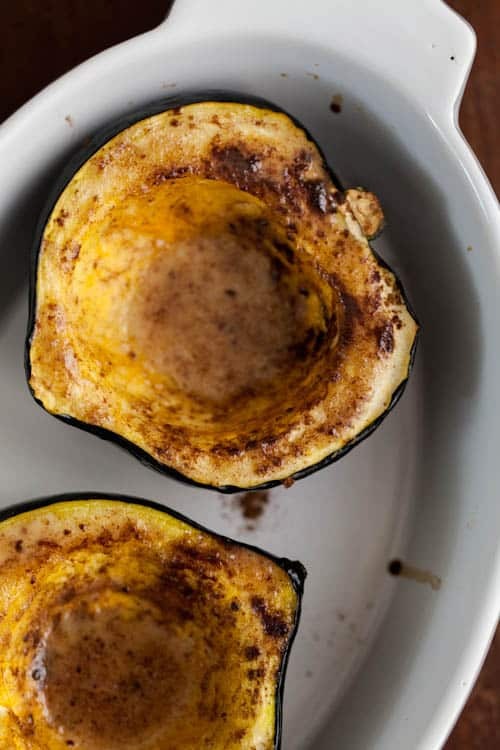 Love how simple and sweet this acorn squash dish is! 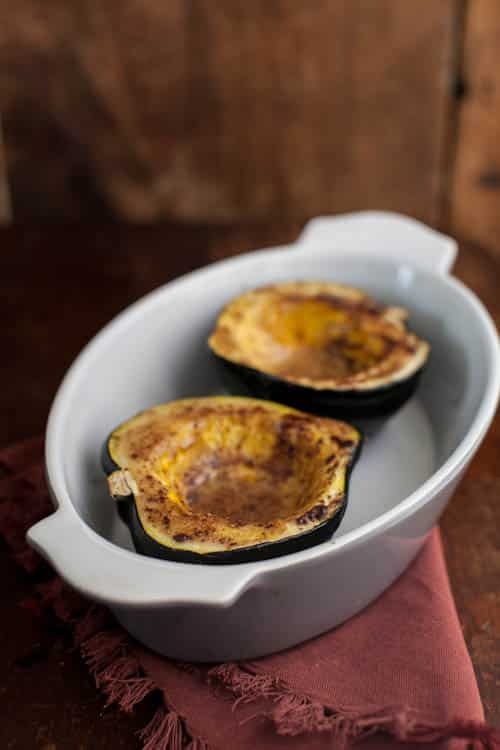 We have an acorn squash sitting on the counter and are in need of a simple, healthy recipe! This fits the bill! Can’t wait to try it tomorrow! I would hate to buy heavy cream just for the 2 tablespoons this recipe calls for. Do you think I could sub with almond milk or coconut milk? I do- it won’t be the same consistency but either would work.